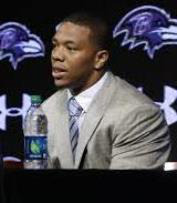 Running back Ray Rice was released by the Baltimore Ravens and suspended by the NFL after knocking out his then-fiancee in an Atlantic City casino elevator in February. Recent high-profile legal struggles of NFL running backs Ray Rice (formerly of the Baltimore Ravens) and Adrian Peterson (Minnesota Vikings) and Carolina Panthers defensive end Greg Hardy have ignited new rounds of discourse about aggression—in professional athletes and among Black males in general. Numerous think pieces and sports talk segments have tried to draw a correlation to the broader population. And, again, the question has surfaced: what is wrong with Black men? “There’s nothing wrong with ‘Black athletes,’ as a group, that isn’t also wrong with any other very large group of human beings,” said Dr. Yago Colás, an associate professor of humanities at the University of Michigan. Colás added that “the white, middle-class public” tends to objectify Black athletes and ignore their humanity, intelligence, emotion and other mental functions and processes. “More specifically,” he said, “we tend to reduce them to their athletic skills and, along with that, to their mere physicality. … This makes us predisposed to categorize them in animal terms as either simple-minded brutes or, at best, deeply irrational humans,” like the media did with Seattle Seahawks cornerback Richard Sherman following his team’s victory in the NFC Championship game last year. The other problem with White America’s perception of the Black athlete, said Colás, is that “we … are racist and so filter the variety of human beings we might encounter in the set ‘Black athletes’ through racist stereotypes about Black men.” Those stereotypes include depictions of Black men as aggressive, violent, threatening, stupid, lazy and undisciplined, he said. Dr. Louis Moore examines African-American history and sports history as an assistant professor in the history department at Grand Valley State University. He agreed with Colás’ observation that much of the problem is the filter through which these stories are told. Moore said the heightened attention on these incidents fits a popular narrative in this country. There is no doubt that issues such as the domestic violence and drug charges recently brought about are longstanding issues in professional sports. For a multitude of reasons—increased technology providing greater constant access to others’ lives, the demands of a 24-hour news cycle, perhaps certain topics being the leagues’ pet issue of the day—the public is more aware of the off-court and off-field actions of professional athletes. But the conversation around these transgressions in sport should be more an examination of American athletic culture, which is often overshadowed in the discussion of Black aggression or inferiority. The idea of upholding a certain degree of “manliness” associated with toughness and intimidation is fueled by locker room cultures that stifle emotional expression and mock vulnerability. “I think athletic culture tends to stigmatize emotional self-awareness and the expression of emotions, especially emotions associated with vulnerability like fear, anxiety, frustration,” said Colás. In addition to masculine and athletic cultural influences, there are also neuropsychological issues at play, particularly with an increased focus on violent behavior. “We shouldn’t discount the possible role played by long-term brain injury in accounting for some of these cases,” Colás said. Significant attention has been placed recently on brain injuries sustained from concussions, particularly in the NFL. A study conducted as part of the ongoing lawsuit against the NFL found that football players are at a significant risk of developing serious brain disorders, and there have been numerous studies linking brain injury and aggressive behavior, for instance. Overarching ideas of masculinity and increased risk for brain injury are certainly not racial issues. And when you consider that most players in the NFL (66 percent) and NBA (76 percent) are Black, proportionally, the coverage of any incidents will be skewed. But acknowledging a skewed ratio of people to cover versus a downright discrepancy in the way the cases are handled is different. “There is nothing wrong with Black athletes, but there is, however, a problem with how they are perceived,” he said.